Introduction: Predator Labs is not a well-known brand here in the United States but the company does sell quite a few of their branded baits throughout the Asia Pacific Region. It is hard to believe that it has been seven years since we last reviewed one of the company�s lures and over this time they have expanded their offerings significantly, pouring much more resources into research and design. We take a look at PR-Lab�s newest series of lures, the Genetic Metamorphosis Series, which makes use of a flow through design to create increased water turbulence. Does this relatively unknown company have what it takes with these new baits to make a big splash? Let�s find out. Impressions: Sounding like something more out of science fiction novel rather than a tackle catalog, the Predator Labs Genetic Metamorphosis lures are a new offering from a company and blends both science and traditional lure design together. Each of the Genetic Metamorphosis lures features the company�s patented �InterFlow Maximized Turbulence System� which is designed to generate additional pressure waves apart from those that are created by the traditional swimming action during the lure�s retrieve. 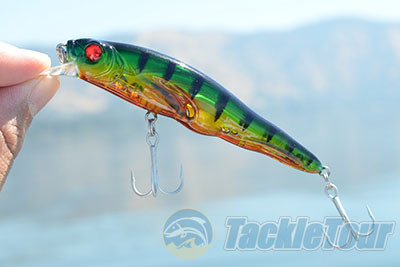 This is intended to amplify the lure�s presence in the water and attract more attention, and consequently more strikes. These lures come from the Company's Genetic Metamorphosis Series and feature channel systems to move water during retrieves called "InterFlow"
There was a lot of study put into the design of these lures and PR-Labs states that this extra turbulence can be detected with the lateral lines of fish and also helps them lock onto the source that is causing the disturbance. When the fish get close enough the lure�s striking patterns and profiles are designed to do the rest, with the visual triggers taking over, at least that is the goal. 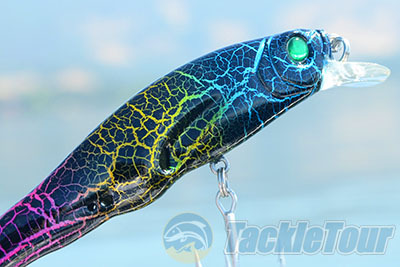 There are a total of four lures in the new Genetic Metamorphosis Series which includes the Shrimp (crankbait), Raven (Minnow style jerkbait), Venom (Topwater popper) and Medusa (Topwater pencil). All of these baits implement the Company�s InterFlow design concept and are available in a range of patterns that are quite unlike what we traditionally see in hardbaits of this class. 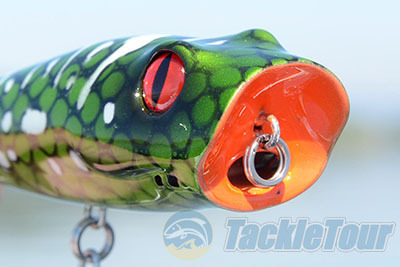 The Raven jerkbait for example features a combination of options ranging from the more traditional Tiger and Pearl patterns to absolutely crazy looking metallic finishes like the Emerald Bass and Spectrum. 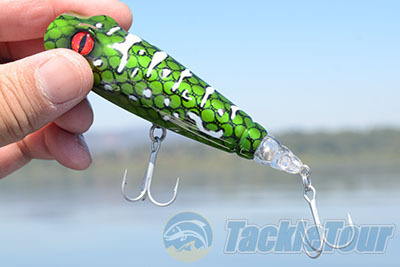 The Venom, which we felt is the most interesting bait in the lineup, is aptly named as the plug follows a snake theme which includes integration of scale like patterns and even a translucent rattle shaped tail. Real World Tests: To test the PR-Labs Venom we headed to our favorite bodies of water to fish topwater baits, the California Delta and Clear Lake. We targeted largemouth bass and used a variety of different outfits and tied the bait on with monofilament, straight braid and hollow braid with a Seaguar fluorocarbon leader. We fished the lure over an entire season on these two bodies of water to gauge the effectiveness of the bait in varying conditions and temperatures. 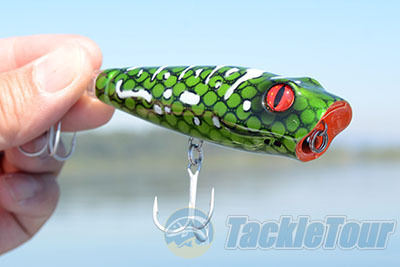 In addition to the Venom we also observed the Company�s Interflow design on the company�s other lures including the company�s Raven jerkbaits. Casting: When you first look at the Venom it looks pretty out there, it is modeled after a snake head for goodness sakes. The lure is textured with segments and under the line tie anglers will find an open mouth design that is actually an intake for water. This large intake manifold is channeled out to four smaller outlets (2 on each side of the head). The Venom weighs in at 19 grams and is relatively straightforward to cast. Within each bait is a combination of a fixed weight and a moving balancer to aid with casting distance and consistency. 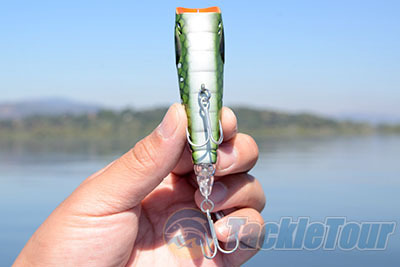 Using a stout casting rod simply bend and send this lure to your desired location and let the fun begin.